Avenger class ships are designed as mine hunter-killers capable of finding, classifying and destroying moored and bottom mines. The mission of MCM 1 class ships is to detect, classify and neutralize all known and projected types of influence and contact mines. There are three primary mission objectives: Minehunting , Mine Neutralization, and Mine Sweeping. The MCM 1 performs precise navigation and clears minefields by sweeping moored, magnetic and acoustic influence mines. The MCM 1 also conducts coordinated operations with airborne and other mine countermeasure forces. This is the largest US Navy Minesweeper to date. The last three MCM ships were purchased in 1990, bringing the total to 14 fully deployable, oceangoing Avenger class ships. These ships use sonar and video systems, cable cutters and a mine detonating device that can be released and detonated by remote control. They are also capable of conventional sweeping measures. The ships are constructed of wood covered with Glass Reinforced Plastic (GRP) sheathing. They are the first large mine countermeasures ships built in the United States in nearly 27 years. Osprey (MHC 51) class ships are also designed as mine hunter-killers. The MHC 51 has a 15-day endurance and depends on a support ship or shore based facilities for resupply. 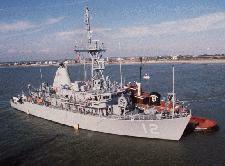 Four of the 14 Avenger-class MCMs transitioned to the Reserve in FY 1996. These state-of-the-art mine countermeasures ships are homeported in Ingleside, TX along with the rest of the Navy's surface mine warfare assets.